Spread over 100 hectares of real estate, Airport Business District is designed for connectivity and clustering of like-minded companies. Watch the video to determine which industry cluster location would best suit your business. Our plan is to progressively develop Adelaide Airport Business District over time and thus capture all of the essential elements necessary to create a vibrant centre of commerce. Watch the video to see the our vision for developing the Airport Business District. We’re moving forward with a plan. So that we can be as accommodating and flexible as your business needs us to be. Both now and in the future. Watch the video and plan the future of your business at Airport Business District. Partner with us and explore the opportunities for your business to prosper. Watch the video to see where you’d like your business to be located. Then let’s work together to make it happen. It’s a safe, secure, low-risk way to do business, with the confidence that the airport will be here for generations to come. And importantly, we’re development ready – so you can talk to us now about how you can establish your business or plan for growth. Have a look at our proerty vision video and contact us to see where your business can be located at a place that suits you best. Growing to a strategic plan. It is vital that any development on Adelaide Airport land proceed in a manner compatible with adjacent land uses and optimum development policies, without compromising operational integrity and economic viability. Conversely, it is important that development surrounding the airport does not compromise the operational integrity of airport operations, taking into account the National Airport Safeguarding Framework (NASF). The land use provisions take into account, among other documents, South Australia’s Strategic Plan (2011) and the 30-Year Plan for Greater Adelaide (2010). The airport is divided into seven precincts. For each precinct there are Objectives and Desired Character Statements for future development, along with Principles of Development Control incorporating Envisaged and Non-Complying uses. 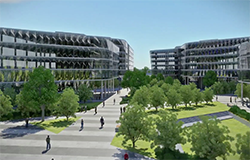 In changes since the 2009 Master Plan, the former Burbridge and Terminals precincts have been combined to form the larger Terminals & Business Precinct, and the Holdfast Precinct has been incorporated into the larger Morphett Precinct. To assist with land use planning, the AAL’s Airport Planning Coordination Forum – which was established in 2007 to develop ongoing strategic partnerships with Commonwealth, State and local governments – also continues to meet regularly to discuss issues regarding airport planning, development and operations, as well as implications of development on surrounding areas. Copyright © 2019 Adelaide Airport. All Rights Reserved.